Yesterday after spending the day doing so many different, mundane things I can no longer recall them all, I went to the mailbox and discovered a package! From Bethany House. It was my hot-off-the-presses copy of the new, repackaged version of my first published book, Arena, which will be releasing July 1. Maybe. A quick check of the general Amazon listing, is confusing at best, indicating that the Kindle version is to be released July 1, but is eligible for pre-order. Even as you can get it on the Kindle for free now if you are a member of Amazon Prime. If you click through to the actual page for the book, there is no mention made of any pre-ordering or July 1 release, only the fact that it’s out of print and you can only get it for Kindle. Then there’s Christianbook.com, which is worse. It has two entries. 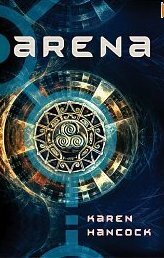 Arena, repackaged, but showing the old cover and saying it will be available for purchase June 16, and Arena showing the new cover but for the e-book which won’t be available until July 1. Worse, each has a single one star review, and each one star review is written by a different reviewer. The reviewer on the repackaged version entry didn’t think it was good or Christian and was disgusted by the “(fairly graphic) sexual violence.” This one is listed as releasing June 15. The reviewer for the e-book entry with the new cover was disappointed because “Unfortunately, this book contains much graphic horror and implied sexual abuses. I could not recommend it as a positive experience for anyone seeking to grow closer to God.” It is listed as releasing July 1, 2012. It all reminds me of when Arena was first released back in 2002 — my very first Amazon review ever was a total slam, though the reviewer did give it 2 stars. I’m not sure why since he found nothing good in it. The odd thing was, he began his spate of reviews for Amazon on March 20, eleven days before Arena’s debut, and ended July 26 all in 2002. During that time he reviewed exactly 6 books. One of his favorites, and the one he reviewed right after Arena, was “The Gospel of Judas” which, as the title suggests, explores “certain heretical ideas” involving the supposed discovery of a document that would cause the downfall of Christianity. Looking back it really seemed like the kingdom of darkness at work. And so seeing how things are going now, it looks like that again. Which I think is cool. This entry was posted in Angelic Conflict, Arena and tagged Arena, ebooks, re-released, repackaged, reviews on June 12, 2012 by Karen Hancock. How exciting is this?!! I’ve been looking forward to the new cover since you announced it a few months back.. And I will pray tonight that this does well. I would LOVE to see new covers for the Guardian-King series…but only as long as Abramm is still on them of course. 😉 do you get a say in that? Thanks, Jessica! For the comment and the prayers. Thanks for this rundown, Christine. I love knowing how different people respond to the different books in different measure. Reminds me that this is God’s gig and not mine. I’m honored (and at the same time… bemused? befuddled?) to serve as inspiration for your writing, and urge you to keep on keeping on. I gotta tell you that I disagree. I actually think that out of all your books (which are all great) that the weakest is “Arena”. Now, by weakest I am not saying it is bad just compared to your later books (Legend of the Guardian King series and Enclave) that it is not as strong. But that is personally. And personally, I know as a writer exactly how you feel. I write what I believe God has given me and I am almost getting ready (about 6 months out give or take since I am not working two jobs) to put out my first book (ePub because I have no idea how to get an agent or write a proposal or pitch). I put out part one of the seven part story (part one is 40k words kind of like a novella) and had many people download it when it was free. I got three reviews that were positive. Yeah! But I also got an email that was from a friend who did not like it at all. Do I focus on the three good ones, nope. I remember the email. Although I am trying to tell myself that it is not about that. So, I know how you feel. But know that my family (that is my wife, my two teenage daughters and, well not my son yet because he is nine, and me love your books). And we can’t wait for the next one. Of course on the other hand, we don’t want you to rush the other one either. LOL!!! Thanks, Patrick! I appreciate the encouragement. And all the best on the launch of your ebook. ooooo love that new Arena cover!! The Guardian King series is one of my all time favorites, so that would be awesome to see what they would come up with for those. As someone who is an aspiring writer, I dread the thought of reviews…the not so kind ones that is. Thank you for the reminder the there’s a bigger thing happening…spiritual warfare at work when HIS name is being proclaimed. Praying for the new hardcopy release! I agree. The new cover is awesome. I also saw a set of covers at Amazon for LOtGK series with a white background base that looked cool also. Thanks, Erin! Glad to know you like it! Thanks for the prayers, too. As to negative reviews, they do take a bit of getting used to. More and more I’m realizing the truth that in many cases, it doesn’t mean I’ve done something wrong. It might mean the reader is literally incapable of understanding and/or appreciating what I’m doing — an unbeliever, after all cannot understand the things of God and they are foolishness to him. It’s good to recall those things when one starts to get too subjective, not as a means of censuring the reader, but rather in keeping the right perspective! You are a light…as is your writing. Arena was good. I will say that the Guardian King series is the best you have written :-). It has been read countless times by me, and it will never leave my shelves. I buy them for those who express the desire to read it. Never doubt in the darkness what God has shown you in the light! Thank you for your devotion to our Shepherd…Go with God! Don’t let those bad reviews get you down – the kingdom of darkness is definitely at work there. Your books are amazing! I will definitely be buying a hardcopy of Arena! And it would be awesome if the Guardian King series were available hardcopy too. I’ve only read them through the library and always wanted copies of my own. Keep up the good work! Oooh! You’ll buy a hardcopy? Awesome! Thanks for the good words about the GK series, as well! Know you know this, but the ONLY reviewer who matters is the Lord. If you’re making a difference in someone’s eternal future and doing it according to His will and plan, that’s all you need. Congratulations on the repackaging – hope it untangles soon!!! Thanks, KC. I love the image “rant and rail” produces in my head! And the fact I, too, have read the end of the Book! Just last week, in fact. Well I for one am looking for the release, and I certainly hope it is made available on the Nook. :o) If not, I am perfectly happy with getting it in either hardback and waiting for the Nook release or getting it onto my Android phone with the Kindle app. I am praying that Arena does really well. I thought it was an amazing allegory for the road to salvation. It’s been a while since I read it and I don’t have a copy, so I will have to buy the hardcopy when it is released. I pray that God will use it again to bring more people into His kingdom! My favorite books, though, are the Guardian King series. I have read them 4 times and have even read them out loud to my sons (with a bit of age-appropriate editing). God has used them many times to speak into my life. Thank you for continuing to let God speak through you!